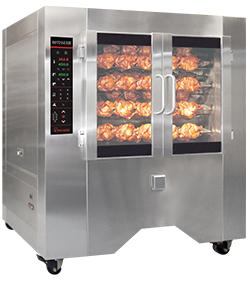 WHY SHOULD YOU USE THE ROTISSERIE ? A vertical rotation cycle (up and down) awaits the chickens, once inside the cooking chamber, to ensure an even cooking. The second rotation cycle is carefully calculated so that every drop of juice from one skewer falls on the one directly below it. Two wide-open toughened glass doors for easy access and optimizing visibility of production, hence stimulating consumer’s impulsive buying. Large doors give access to the vast interior, and the way that the skewers are fixed makes loading and unloading easy. This equipment is delivered fully assembled and ready to be used. It can easily pass through a standard door of 36'' x 80''. All electrical, gas, water and chimney hook-ups, as well as the rotisserie burner start-up, are at the customer's expense and must be performed by a qualified technician and according to local code. Gas units must be vented using a hood. For your security, our rotisseries meet the ETL.